On Friday evening I thought I’d take a quick trip up into the hills to see if any of the waterfalls had started to run after all the rainfall we had. I decided to head up to Hovea Falls as they were the easiest to get to. I’m happy to say that yes there was some water flow but I think they need another couple of weeks of rain before they really start to flow at their maximum. So back to being patient again, I think August is the best month for waterfalls in Perth. What do you guys think? Perhaps we should all head down south and find some decent waterfalls in the meantime. 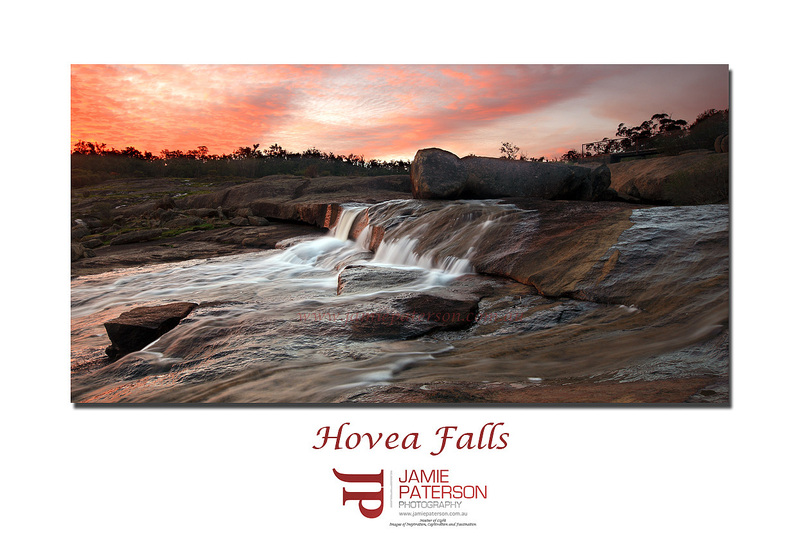 This entry was posted in Australian Landscapes, Australian Seascapes, Perth Photos, Sunset Photos and tagged australia, canon, Jamie Paterson, landscape, long exposure, reflections, water, waterfall, western australia. nice little drop there Jamie, some beautiful light on the scene makes the shot IMO. Nothing much wrong with that Jamie..great shot. Nice one. Check the selection you have made around the trees. The rock in believable, but the trees look like you just chopped the top off them. The ones on the right are fine, but the ones on the left are noticable. Wow, we have huge waterfalls here! great capture! what was the length of exposure? Thanks for stopping by. Yeah I thought it was a really nice orange sunset and the atmoshpere was really nice as well as there was no one else around. I got there way too early so found a nice flat rock and just relaxed watching the water rush past. Thanks mate. It was great watching this subtle sunset appear. I don’t know why I didn’t spot that before. Thanks for spotting it. I definitely like the colour in the sky better than the falls. Thanks for stopping by. From memory I was using F11 ISO50 and 1/2 a second. Cheers Jamie – at half a second are you just using a motion blur to enhance the movement of the water? That water looks delicious. For some reason it seems like ages since you last posted. It was two weeks since I last posted. I’ve been really sick and pretty much not left the house at all. Nice shot Jamie. Looks like it was a great evening. All of your recent shots have been bang on but….I feel that the composition/framing is a little off with this one. The main subject is centre of frame which i`m not sure works for this type of 2:1 crop. Have you got another frame to the left? as i think a 3:1 with more of the falls left of frame would work. Or even a 3:2 crop a little wider, cropping out the right of frame. Just voicing my thoughts. I think it would be great if we all offered a little more CONSTRUCTIVE criticism through or blogs. I agree with you, any contructive critique that helps us improve is always welcome. I’d have to be honest and say that this photo was never meant to be a masterpiece, more just a ‘Hey Everyone, this is how much water is running at the moment’ photo. LoL. As such I didn’t put any real effort into it. Having said that I should’ve made that clearer. This photo is in this format as for some reason I suffered ‘foginess’ around the left hand side of the photo so I just cropped it out. I think your photos of Canada are amazing.